Everybody deserves a treat now and then, right?! Although maybe I am a little on the quick side to convince myself I deserve that calorific hot chocolate laden down with gooey marshmallows to cheer myself up after a bit of a gloomy day- after all it is like a hug in a mug! 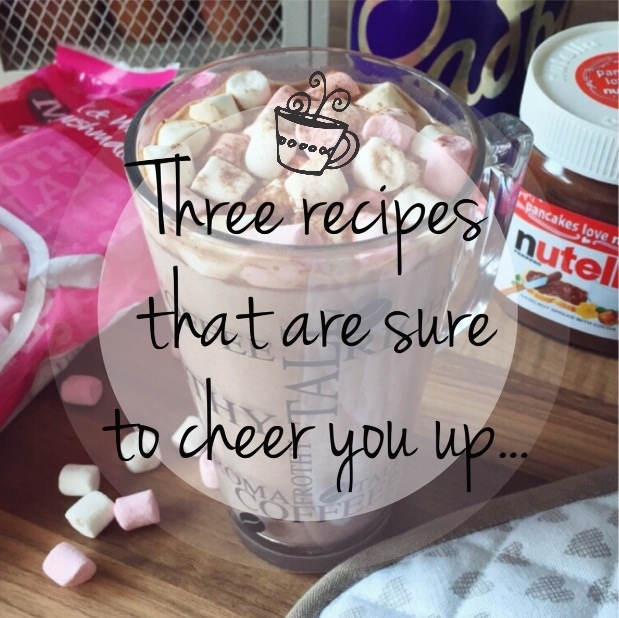 Wether you've had a bad day at work/school or like me you've made the snap decision that you're in serious need of something sweet then here's three recipes that are sure to brighten your day... Oh and I'd just like to apologise in advance for being such a bad influence! 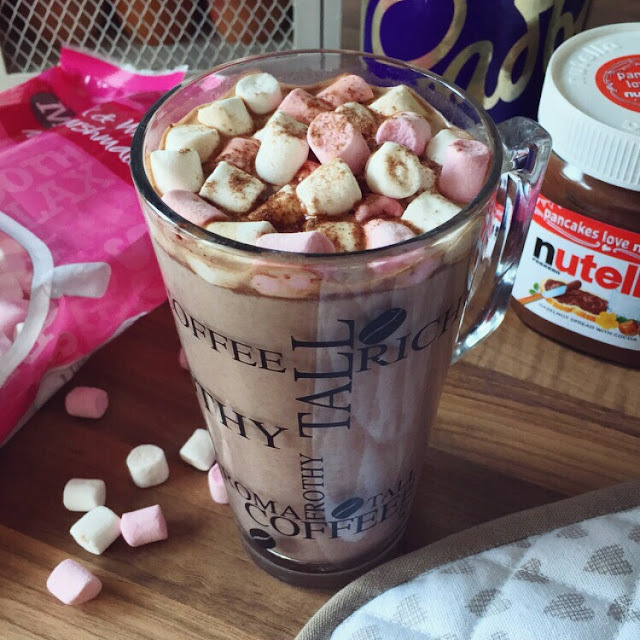 If you aren't a fan of Nutella- I find it mind blowing how people don't like it- then you could use Cadbury's instant hot chocolate instead which is another of my favourites! •Put Nutella and 1/3 cup of milk into a small saucepan over a medium heat and whisk until blended. •Add remaining milk and increase the heat to medium-high, and whisk until hot and frothy. To finish add a squirt of cream and a handful of marshmallows, enjoy! I know it was Pancake Day last week but who says you can't eat them everyday if you wanted to?! My favourites are Nutella and strawberry- there's a very subtle Nutella theme, isn't there?- but you could top yours with anything you like! •Put the flour and a pinch of salt into a large mixing bowl and make a well in the centre. Crack the eggs into the middle, then pour in about 50ml milk and 1tbsp of oil. Start whisking from the centre, gradually drawing the flour into the eggs, milk and oil. Once all of the flour is incorporated, beat until you have a smooth, thick paste. Add a little more milk if it is too stiff to beat. •Add a good splash of milk and whisk to loosen the thick batter. While still whisking pour in a steady stream of the remaining milk. Continue pouring until you have a batter that is the consistency of slightly thick single cream. •Heat the pan over a moderate heat, then wipe it with oiled kitchen paper. Ladle some batter into the pan, tilting the pan to move the mixture around for a think even layer. Leave to cook undisturbed for about 30 seconds. Once the mixture starts bubbling you're ready to start flipping. 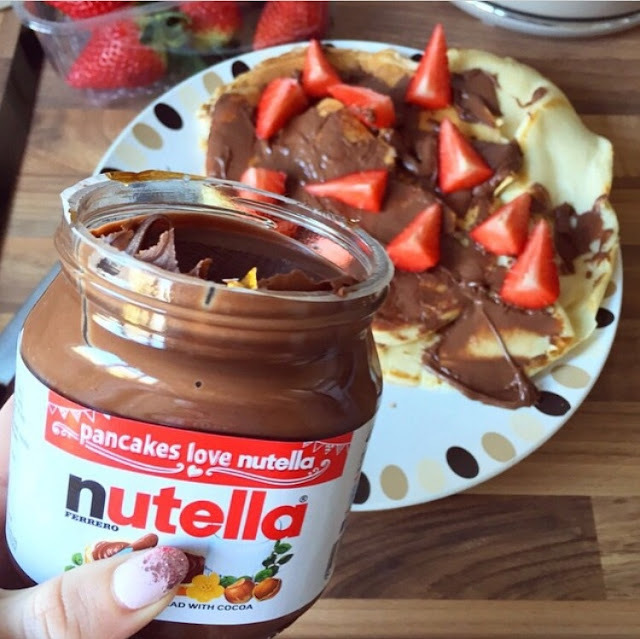 •Once you've finished flipping your pancakes fill with whatever you like such as Nutella and strawberries, bon appetite! 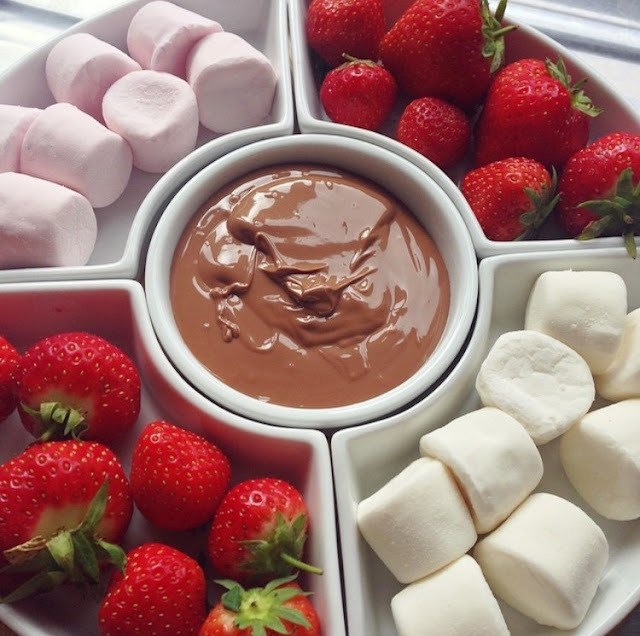 A chocolate fondue is my absolute fave treat so I just had to include it in this blogpost. I've decided not to talk you through the method for this one as it's pretty obvious that all you have to do is melt the chocolate and then prepare your chosen treats, happy dunking! If you try any of these treats then I really hope you enjoy them, be sure to let me know what you thought! What's your favourite treat?